Tattoos were once the mainstay only of rebels and rule breakers, coming to represent a tough exterior and, often, an even tougher interior. However, in recent years, tattoos have become much more mainstream, with millions of us across the world choosing to get our own ink. Whether it’s a meaningful symbol or a beloved phrase, you’ll find tattoos almost everywhere you look these days. However, unfortunately, not all tattoos come with happy memories. Some come in the form of a drunken mistake, others an ill-judged portrait of your ex, while some just fall out of fashion over the years, with tattoo removal becoming increasingly popular to erase them. So, just how do you go about removing your tattoo? We’ve put together a quick guide to laser removal to give you everything you need to know. Before we move on to discussing the benefits of laser removal and how it all works, it’s important to take a look at all of the different methods of tattoo removal available to you. Laser removal is by far and large the most popular method of removing tattoos and is also believed to be the most effective. Alternatively, you can opt for tattoo removal creams, which are much less effective, as well as surgical removal, which is an extreme method for removing tattoos, involving cutting out small sections of the skin or sanding the skin down. You may also find chemical peels listed as a tattoo removal method but these have been found to be ineffective. For more information on the different types of tattoo removal available, check out this post by Michael Green MD. With so many different treatments on offer, it can be difficult to decide which one to choose, but we believe laser removal is the best option for many reasons. Laser removal has been proven to be the most effective form of treatment compared to the other methods and has a high chance of success, whereas tattoo removal creams and chemical peels merely reduce the appearance of tattoos rather than removing them. Similarly, laser removal is much less extreme than surgical removal, requires less invasive procedures, and has lower chances of any scarring or burning. It’s also less painful than surgical removal, which requires local anaesthetic, and requires less recovery time. So, how does laser removal actually we work? We spoke to Jeunesse Beauty, specialists in laser tattoo removal, to find out more. “Many of our clients are a bit apprehensive when it comes to laser removal as it sounds much scarier than it actually is. In fact, it’s a relatively painless procedure that is really effective. “Laser removal works by breaking down the ink in the lower level of the skin where the tattoo is located, by sending short bursts of controlled light directly into the ink. This causes the ink molecules to shatter and the remains are gradually absorbed into your skin, without causing any damage to the surrounding area. The number of treatments that are required for laser tattoo removal depends on a number of factors, including its size, colour and age. The smaller the tattoo, the fewer treatments that will be required, and an older tattoo will also be easier to remove as the ink will have naturally faded over time, again requiring fewer treatments. 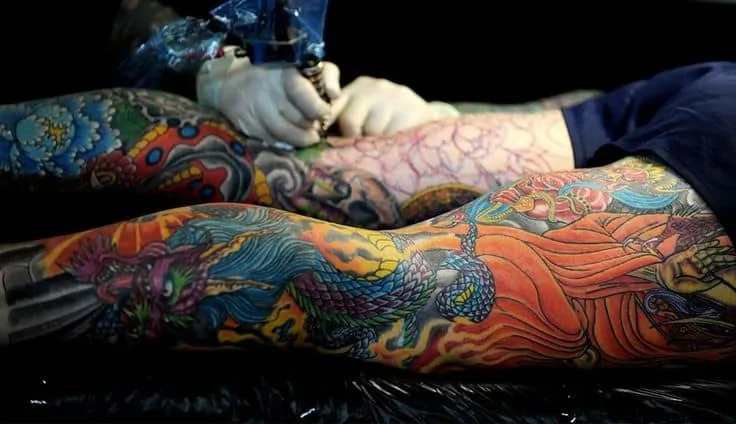 For colourful tattoos, especially those containing light blue, yellow and red, you will require more treatments as these colours are harder to remove, and a newer tattoo will require more treatments due to the freshness of the ink. In general, a small, black tattoo could be removed in around four to five sessions, while a large, more colourful or new inking could take red or more.